, a gentleman of great eminence in the literary and political world, was born in Scotland in 1730. 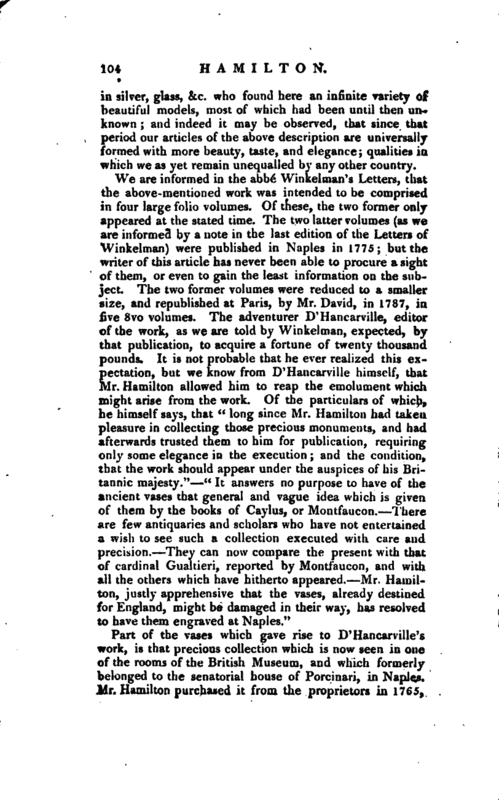 He was of a branch of the family of Hamilton, which was considerably reduced in circumstances at the time of his birth; he himself having repeatedly declared to his friends in Naples, that “he was condemned to make his way in the world with an illustrious name and a thousand pounds.” He was not, however, doomed to spend many years of his youth in such narrow circumstances; as in 1755 he married a young lady of amiable character, with whom he received a fortune of 5000l. a year. 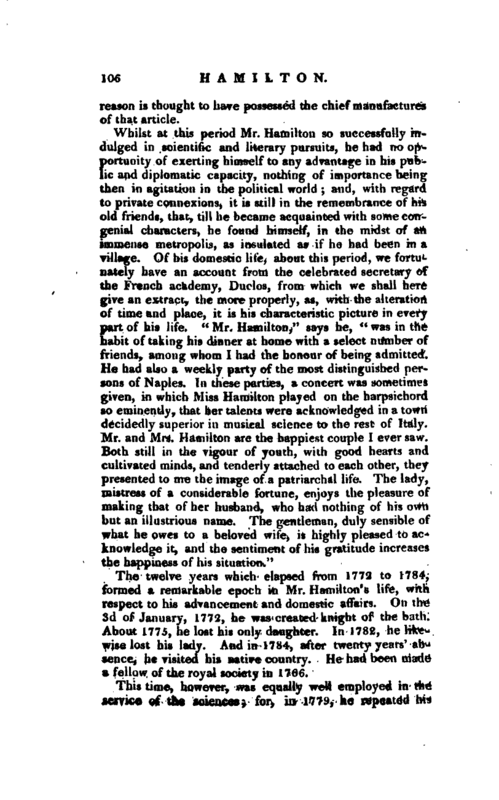 The active and important part of his life began from the moment in which he entered the diplomatic line; and we may consider it as a circumstance peculiarly fortunate for the literary world, that he was destined to remain nearly the rest of his life in a country truly classical, in regard to the fine arts and natural history; pursuits for which he had early evinced the greatest predilection. Mr. Hamilton was appointed ambassador to the court of Naples in 1764; and from that time to 1800, in which he was recalled, it may be said, with the strictest justice, that he did much more for the advancementof the fine arts, natural history, and antiquities, than any individual or corporation in that metropolis; perhaps, or even the government itself. In Naples the state of those branches of knowledge, which constituted Mr. Hamilton’s pursuits, was at this time very low, and as far as early and intense application may be considered proofs of a predominant passion, it appears that the objects of natural history chiefly engaged his attention. In a short period from his arrival, he had already collected a vast number of articles connected with this science, and had thus formed a valuable cabinet, of which, according to the expression of one of his friends, “he could be himself the ablest demonstrator.” Between 1764, and the middle of 1767, he visited Vesuvius no less than twenty-two times, and had as often observed the different spots around Naples affected by volcanic eruptions; and it was universally remarked by those who had the pleasure, to accompany him in these excursions, that he was the best and most instructive “Cicerone” that could possibly be found for such occasions. He also visited Mount Etna, and the Eolian islands, places which had not been examined with such attention before. The phenomena which their surface presented to his view did not satisfy his | curiosity: he observed the interior parts of the soil, and every minute circumstance that attended the operations of nature: not one of the different substances which had ever issued from these volcanoes was left unnoticed. In all his excursions he was constantly accompanied by an artist of great merit, Mr. Fabris, who drew plans and delineated such objects as were most interesting and striking. The “Campi Phlegraei” were chiefly calculated to exhibit the view of the several spots already described. The drawings, by Mr. Fabris, were coloured with surprising art and great force of expression, and represented nature with the utmost accuracy and truth. Each plate was accompanied by concise and perspicuous explanations in English, and French. In the first volume, a large map was | Also exhibited of the gulph of Naples and the country contiguous, which is unrivalled for its beauty and splendour. And in the author’s letter to sir John Pringle, dated Naples, May 2, 1776 (which may be considered as a dedication of the Work to the royal society), some additional observations on the subject were communicated, which had not been inserted either in the partial letters to the late Mr. Maty, or in the 8vo edition of them in 1772. In short, the publication was so accurate, so splendid, and so magnificent, as to have excited a surprise how such an invaluable performance could make its appearance in the south of Italy. A new phenomenon, however, occurred after this publication, which was too striking not to excite a peculiar attention in our ingenious naturalist, and not to engage him in a new work. We allude to the great eruption of Mount Vesuvius, on the 8th of August, 1779, and to the “Supplement” to the “Campi Phiegraei,” to which it gave rise. As was his custom, Mr. Hamilton had communicated a description of that wonderful event to the royal society, which was printed in the first part of the Philosophical Transactions for the year 1780. He afterwards, however, as he had done with his former ones, collected these observations, and formed of them a regular work. In the year of the great eruption, he published in Naples, a fine edition of the above-mentioned book, beautifully illustrated by coloured prints, from the drawings of the same artist, Peter Fabris; the drawings and illuminations being likewise copied from nature, under his own inspection. 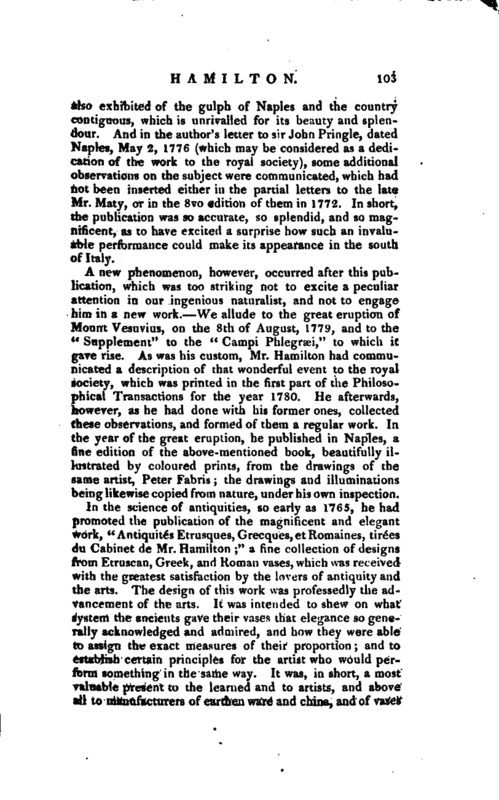 In the science of antiquities, so early as 1765, he had promoted the publication of the magnificent and elegant ttrork, “Antiquites Etrusques, Grecques,etRomaines, tire*es du Cabinet de Mr. Hamilton;” a fine collection of designs from Etruscan, Greek, and Roman vases, which was received with the greatest satisfaction by the lovers of antiquity and the arts. The design of this work was professedly the advancement of the arts. It was intended to shew on what system the ancients gave their vases that elegance so generally acknowledged and admired, and how they were able to assign the exact measures of their proportion; and to establish certain principles for the artist who would perform something in the same way. It was, in short, a most valuable present to the learned and to artists, and above all to manufacturers of earthen ware and china, and of vase | in silver, glass, &c. who found here an infinite variety of beautiful models, most of which had been until then unknown; and indeed it may be observed, that since that period our articles of the above description are universally formed with more beauty, taste, and elegance; qualities in which we as yet remain unequalled by any other country. Part of the vases which gave rise to D’Hancarville’s work, is that precious collection which is now seen in one of the rooms of the British Museum, and which formerly belonged to the senatorial house of Porcinari, in Naples. Mr. Hamilton purchased it from the proprietors in. 1765, | and it still is a matter of surprise with the greatest of our artists, that it was ever suffered to go out of its native land. In Naples, however, it never occasioned any surprise; as it is there known, that full rive years before the purchase, the same valuable property, through the means of the famous Theatin lather Paciaudi, had been offered to the count of Caylus; and, in fact, the best-informed Neapolitans were fully convinced that it was much better that such precious monuments should be in the power of some active nation, in which they might be put to the best use, than to remain in their own country, where they would have been forever useless. About the same time (in 1767), the British Museum received from Mr. Hamilton two other valuable presents: 1st. A complete collection of every sort of matter produced by Mount Vesuvius, by which he thought it might be proved that “many variegated marbles and many precious stones are the produce of volcanos, and that there have been volcanos in many parts of the world, where at present there are no traces of them visible.” 2. Two very scarce and interesting books, respecting the formation of the celebrated new mountain at Pozzuolt, published at Naples, a few months after the event, in 1538: the one written by Marc Antony delli Falconi; and the other by Peter James di Toledo. 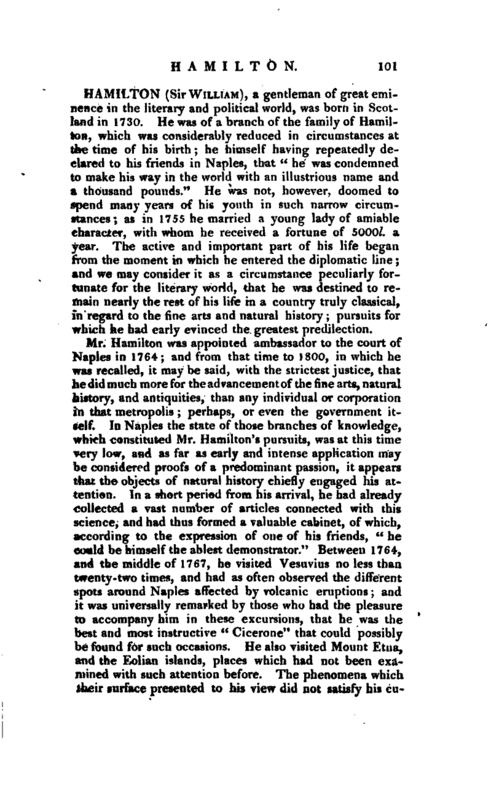 Among the several persons whom Mr. Hamilton honoured with his patronage at Naples, we shall only mention the celebrated engraver, Morghen; as it was owing to his encouragement that this eminent artist, in 1769, published that elegant collection of views at Pozzuoli and other spots in the neighbourhood of Naples. 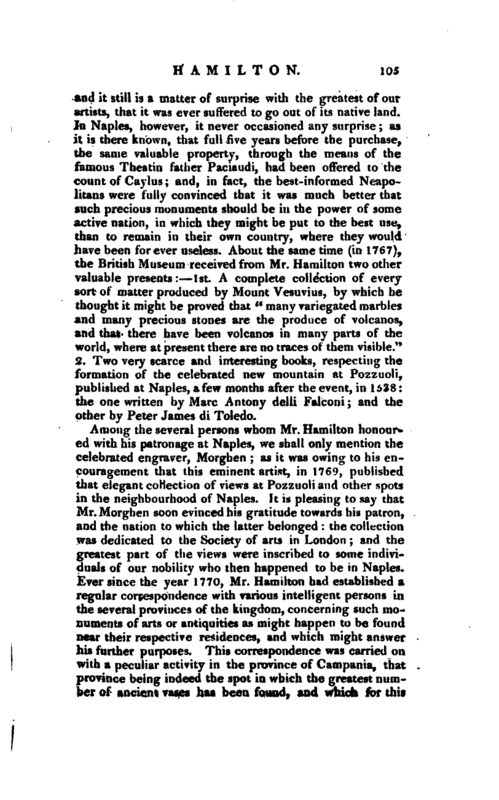 It is pleasing to say that Mr. Morghen soon evinced his gratitude towards his patron, and the nation to which the latter belonged the collection was dedicated to the Society of arts in London and the greatest part of the views were inscribed to some individuals of our nobility who then happened to be in Naples. 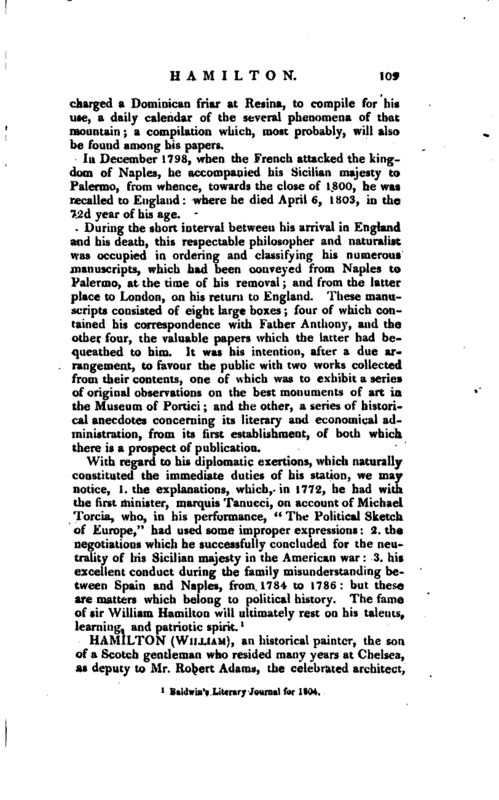 Ever since the year 1770, Mr. Hamilton had established a regular correspondence with various intelligent persons 4n the several provinces of the kingdom, concerning such monuments of arts or antiquities as might happen to be found near their respective residences, and which might answer his further purposes. This correspondence was carried on with a peculiar activity in the province of Campania, that province being indeed the spot in which the greatest number of ancient vaseshas been found, and which for this | reason is thought to have possessed the chief manufactures of that article. The twelve years which elapsed from 1772 to 1784, formed a remarkable epoch in Mr. Hamilton’s life, with respect to his advancement and domestic affairs. On the S Au f Januar >"> 1772 > he was created knight of the bath. About 1775, he lost his only daughter. In 1782, he likewise lost his lady. And in 1784, after twenty years’ absence, he visited his native country. He had been made a tellow of the royal society in 1766. 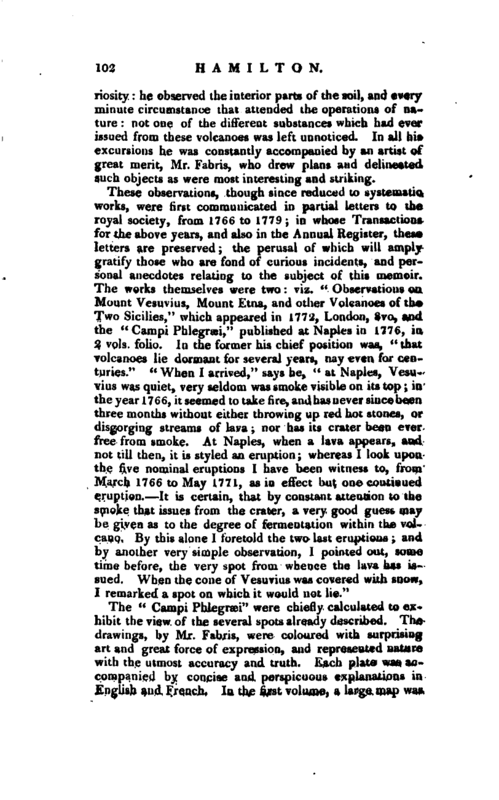 This time, however, was equally well employed in the service of the sciences; for, in 1779, he repeated his | visits to Mount Vesuvius, and published the Supplement already mentioned; in February 1783, he undertook the journey to Calabria, to observe the phenomena produced by the dreadful earthquake which just before had desolated that beautiful province, and of which he subsequently gave an account, in a letter to sir Joseph Banks, inserted in the Transactions of the Royal Society;“and, so early as 1777, he wrote an excellent memoir on the discoveries until then made in Pompeii; which memoir, accompanied with 13 beautiful plates, was inserted in the fourth volume of the” Archaeologia,“and by which we are informed,” that the city was supposed to have been a mile in length, and about three miles and a half round; that only one hundred yards of a principal street, supposed to run through the whole city, had then been cleared; that the width of the horse-way was said to be in general ten feet eight inches English, and the elevated foot-way on each side, about three feet wide that the plan of most of the houses was a square court, with a fountain in the middle, and small rooms round, communicating with that court; and that fragments of large panes of glass were found there, shewing that the ancients of this period knew well the use of glass for windows." His most truly meritorious labours, however, at the close of the above mentioned period, were those which had in view the unrivalled museum of Portici; an object which lad not yet been accessible to his researches. 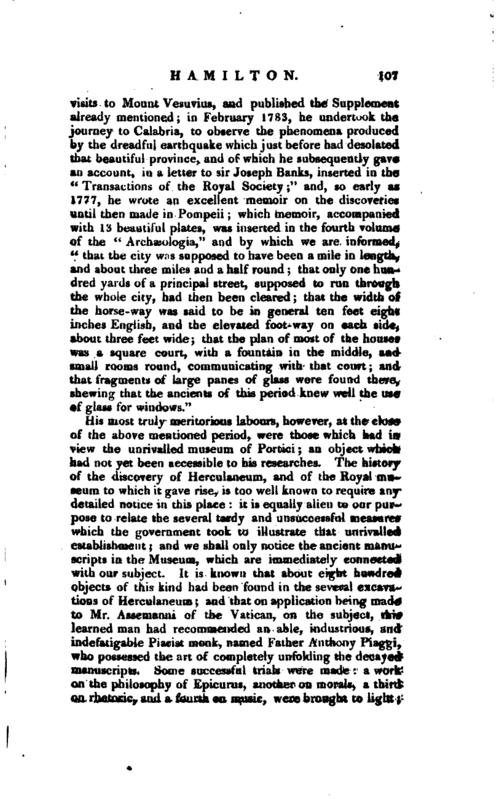 The history of the discovery of Herculaneum, and of the Royal museum to which it gave rise, is too well known to require any detailed notice in this place: it is equally alien to our purpose to relate the several tardy and unsuccessful measures which the government took to illustrate that unrivalled establishment; and we shall only notice the ancient manuscripts in the Museum, which are immediately connected with our subject. It is known that about eight hundred objects of this kind had been found in the several excavations of Herculaneum; and that on application being made to Mr. Assemanni of the Vatican, on the subject, this learned man had recommended an able, industrious, and indefatigable Piarist monk, named Father Anthony Piaggi, who possessed the art of completely unfolding the’deca3ed manuscripts. Some successful trials were made: a work on the philosophy of Epicurus, another on morals, a third on rhetoric, and a fourth on music, were brought to light: | and of the last, the author of which was a Greek named Philodemus, thirty-eight full columns were happily copied. Father Anthony’s services were still more beneficial; he instructed in his art a pupil named Merli, afterwards as able as himself. Neither of them, however, persevered in their tasks: they complained of the supineness of the ministry, and of their own scanty allowance. Among the papers left by sir William at his death, are found more than fifty memoirs directed by Father Anthony to the marquis of Sambuca, soliciting his patronage for the great work of the manuscripts, to which solicitations that minister seemed to be deaf. Numberless other memoirs of the kind were also presented to several persons in the royal service, and they met with no better success. The consequence was, that Father Anthony at last put himself under the protection of sir William, and tendered his services for any information which the latter might wish concerning the Museum. The propriety of accepting this offer may be questioned. It was considered, however, by one who was not particularly acquainted with the administration of the establishment, as too important not to meet with an immediate compliance: a treaty was concluded, that sir William should grant to Father Anthony a pension of 600 ducats a year (100l. ), and the latter should regularly send to him every week a sheet of original information; and in order to elude any ministerial inquisition, it was also agreed that the correspondence should be carried on in cyphers. 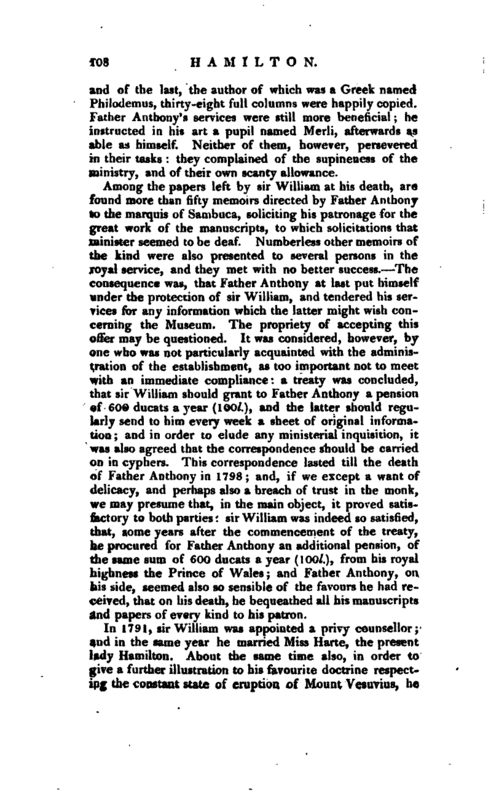 This correspondence lasted till the death of Father Anthony in 1798; and, if we except a want of delicacy, and perhaps also a breach of trust in the monk, we may presume that, in the main object, it proved satisfactory to both parties: sir William was indeed so satisfied, that, some years after the commencement of the treaty, he procured for Father Anthony an additional pension, of the same sum of 600 ducats a year (100l. ), from his royal highness the Prince of Wales; and Father Anthony, on his side, seemed also so sensible of the favours he had received, that on his death, he bequeathed all his manuscripts and papers of every kind to his patron. In 1791, sir William was appointed a privy counsellor; and in the same year he married Miss Harte, the present lady Hamilton. About the same time also, in order to give a further illustration to his favourite doctrine respecting the constant state of eruption of Mount Vesuvius, he | charged a Dominican friar at Resina, to compile for hit use, a daily calendar of the several phenomena of that mountain; a compilation which, most probably, will also be found among his papers. In December 1798, when the French attacked the kingdom of Naples, he accompanied his Sicilian majesty to Palermo, from whence, towards the close of 1800, he was recalled to England: where he died April 6, 1803, in the 72d year of his age. During the short interval between his arrival in England and his death, this respectable philosopher and naturalist was occupied in ordering and classifying his numerous manuscripts, which had been conveyed from Naples to Palermo, at the time of his removal; and from the latter place to London, on his return to England. These manuscripts consisted of eight large boxes; four of which contained his correspondence with Father Anthony, and the other four, the valuable papers which the latter had bequeathed to him. Jt was his intention, alter a due arrangement, to favour the public with two works collected from their contents, one of which was to exhibit a series of original observations on the best monuments of art in the Museum of Portici; and the other, a series of historical anecdotes concerning its literary and economical administration, from its first establishment, of both which there is a prospect of publication. Baldwin’s Literary Journal for 1801.